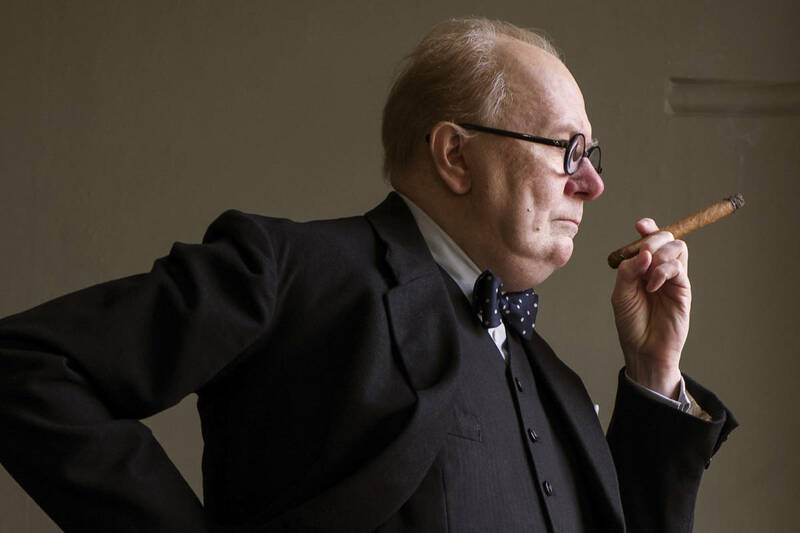 Gary Oldman delivers a career-defining performance as British Prime Minister Winston Churchill in Darkest Hour. The four hours spent putting on makeup every morning during the three months of filming on the set of director Joe Wright’s film are worth every minute as Oldman is, for all intents and purposes, the Prime Minister. His performance, to say the least, is unbelievable. You’re not looking at Oldman on screen. You’re looking at Churchill and Oldman is going to win every single award for this performance. Wright directs from a script that was well-researched by screenwriter Anthony McCarten but not without a scene or two added for dramatic purposes. It’s known that the PM went AWOL at times and made himself available to the public. A scene exists in the film for such purposes more so to mark a turning point for the character. Ben Mendelsohn portrays King George VI, a person whose portrayal won Colin Firth the Oscar for The King’s Speech at the 83rd Academy Awards in 2011. It’s not as if the king or PM had not been portrayed by other actors before but by actors with career-defining performances in those roles. The comparisons are inevitable, but Mendelsohn holds his own against the towering Oldman and master’s the King’s stutter. As Ronald Pickup portrays the previous prime minister, Neville Chamberlain, one cannot help but wonder how John Hurt would have approached the role. Kristin Scott Thomas, Lily James, and Stephen Dillane play supporting roles as Clementine Churchill, personal secretary Elizabeth Layton, and Foreign Secretary Lord Halifax, respectively. It’s clear that Halifax and Churchill have a clear disagreement over how to proceed. Layton plays an important part, not just as Churchill’s personal secretary but in the film’s point of view. The first act goes by rather fast but despite the commanding performance by Oldman, the film slows down as the film approaches a climax. As the “blood, toil, tears, and sweat” speech gets delivered early on following Churchill’s rise to power, it’s just a matter of waiting for the inevitable speech delivered on June 4, 1940 as ships set sail to evacuate the troops at Dunkirk. It’s in this regard that Darkest Hour serves to complement the Christopher Nolan-directed film. Dario Marianelli’s score, mostly written before the film, greatly complements the film and Bruno Delbonnel’s cinematography is astonishing to say the least. Given England’s mood at the time, Buckingham Palace gets a subdued look in terms of lighting. Production designer Sarah Greenwood, set decorator Katie Spencer, and costume designer Jacqueline Durran do an amazing job in recreating not just the 1940s but the House of Commons and the War Rooms. Durran went as far as going to all the suppliers who dressed Churchill in order to replicate the clothing and accessories. The big award goes to David Malinowski, Lucy Sibbick, and Kazuhiro Tsuji in somehow find a way to make Oldman look like Churchill. Rather than span the course or Churchill’s accomplished life, screenwriter Anthony McCarten was wise to narrow it down to the span of just one month, England’s darkest hour if you will. The best biopics are the ones that do just this: find a moment in their life and focus on that. This is what makes Darkest Hour work so well because Oldman rivals Daniel Day-Lewis’ performance as President Abraham Lincoln in Steven Spielberg’s Lincoln. Focus Features will Darkest Hour in New York and Los Angeles on November 22, 2017. The film expands into more locations on December 8, 2017. Glass is a mixed bag of good and bad that is sure to split audiences down the middle.